New York City has done well preserving its historical architecture. Many remnants of the 19th century and even earlier survive. 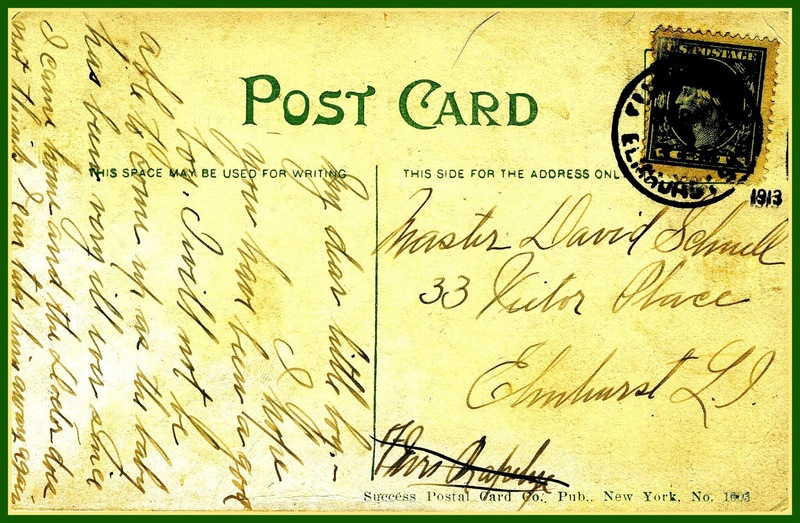 The following are samples of some of what I've found while searching for locations of businesses advertised by the trade cards in the Earl J. Arnold Advertising Card Collection - 1885. In New York City, new buildings don't just block out the sun, they reflect it as well. 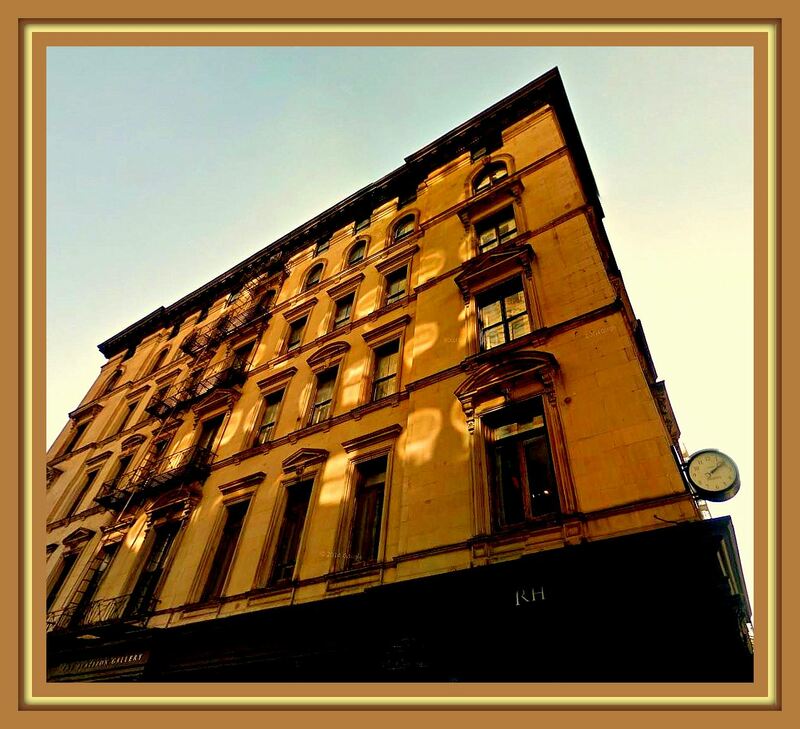 As 19th century buildings are surrounded by new neighbors, all is not hidden in darkness. Bouncing light creates new beauty. 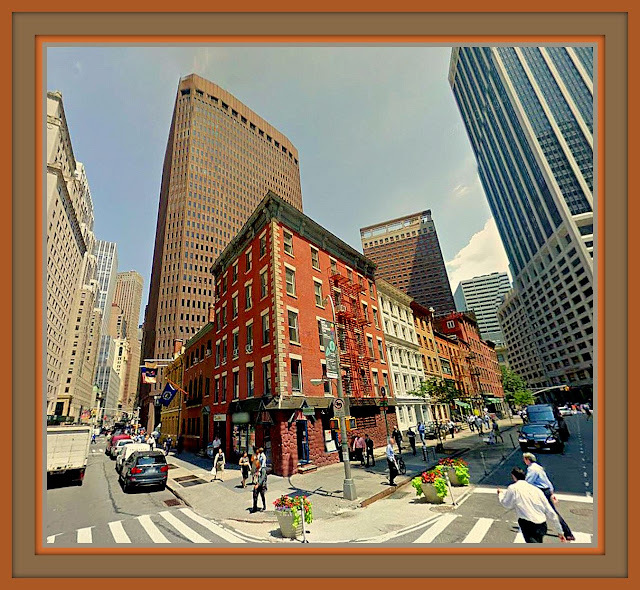 Google Street View allows us to see what's going on at our leisure. Google photography is usually available for several years at any one location, enabling the viewer a choice of angles and lighting conditions. Wildlife makes some Street Views special. To my surprise, in New York and Boston, Herring Gulls seem more likely to appear than pigeons. Visual history surfaces frequently. 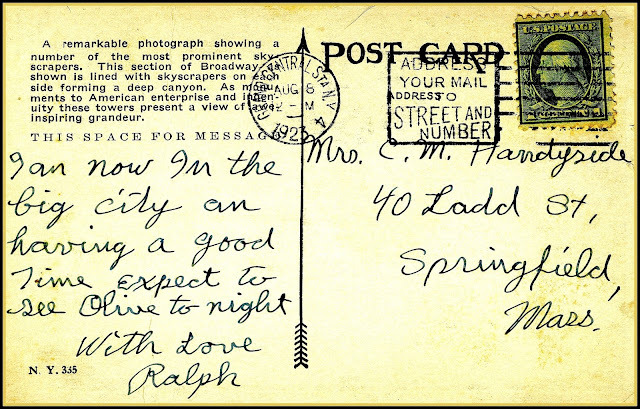 Written narratives can explain details and dates, but sometimes it's more fun to know just a part of the story and tease out the rest with our imaginations. Google Street View leads to some exciting discoveries. A little patience can yield satisfying rewards! Empty Hearth on South St.
to encourage architects to add color to modern buildings. Note the contrast between centuries! You'll note the dates on the Google Street View shots above and below are not current. It pays to explore all the dates Google has available for each shot. 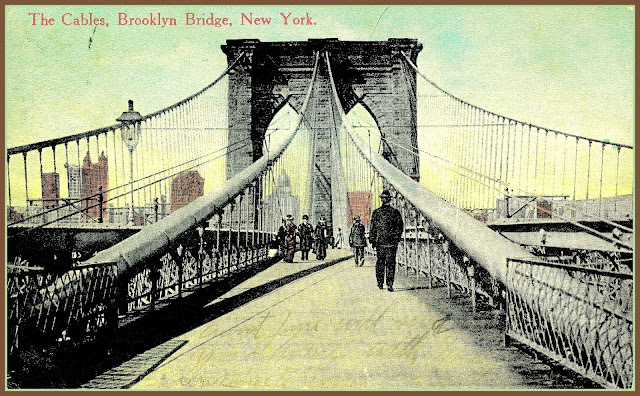 Above, the Manhattan bridge foundation was in a most favorable light in 2009. Turns out that was a good month for picturesque skies, too. The waterfront, once filled with wharves in this neighborhood, is now mostly expressway. "My dear little boy, I hope you have been a good boy. I will not be able to come up as the baby has been very ill ever since I came home and the Doctor does not think I can take him away again. Aunt June will send you home with...."
save one or two alone. from the world's worst poet. I was last in New York City in 1972. As a visitor from a very small city upstate, I anticipated all manner of tall skyscrapers. The canyons did not disappoint. Near the Bowery, however, the sight of a series of smaller older structures was a great surprise. So that is what I remembered. 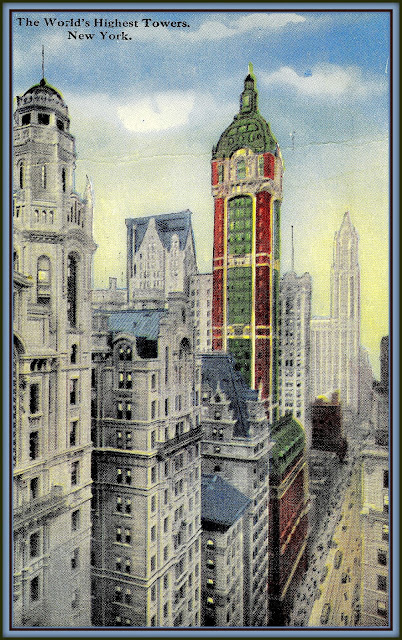 As of July 2011, the only 1923 skyscraper remaining was the Trinity Building, first in left foreground of the postcard. This is Google Street View. "Our Vanishing Legacy was the first primetime broadcast advocating preservation efforts in New York City. Written and produced by award-winning producer Gordon Hyatt, the film has rarely been screened since it originally aired on WCBS-TV on September 21, 1961. Our Vanishing Legacy, made prior to the passage of the New York City Landmarks Law in 1965, looks at threats to the City's architectural heritage and argues the need to enact a law to protect important landmark buildings.